On her latest album, Martha Redbone harvests soul food from the poems of William Blake, and tells PopMatters all about the emotional, powerful journey she went on to get there. Martha Redbone can turn raindrops into rays of sunshine. At least that's what a few hundred New Yorkers and tourists witnessed on July 23rd, 2013. The setting was Brookfield Place, a waterfront plaza in downtown Manhattan that overlooks the Hudson River. On that particular evening, a sudden downpour nearly brought the plaza to sea level. Then the Martha Redbone Roots Project took the stage. Accompanied by a five-piece band, Redbone's voice seemed to clear the clouds and summon a ball of orange fire that shone brighter than the Statue of Liberty's torch. Such is the power of Martha Redbone when she closes her eyes, raises her hands, and delivers a spine-tingling belt. Those kind of moments have distinguished much of the past twelve months. Indeed, 2013 represents a benchmark in Redbone's career. The Garden of Love: Songs of William Blake is the artist's third full-length release but also the one that has catapulted her to new levels of renown and united fans of all musical persuasions. From New York City to Iowa City, from San Francisco to Burlington, Vermont, audiences have applauded the album's unique marriage of William Blake's poetry and the music of Redbone's Appalachian roots. It's what The New Yorker calls "a brilliant collision of cultures" and "Dean of American Rock Critics" Robert Christgau declares "a major find". Produced and arranged by Nitty Gritty Dirt Band member John McEuen, along with additional production by David Hoffner, The Garden of Love is a stunning showcase for Redbone's storytelling gifts. Composed by Redbone, McEuen, and Aaron Whitby, the music and melodies bring the timeless themes of Blake's 18th-century poems into the present day. 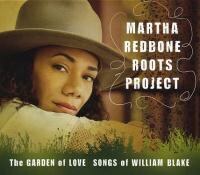 So what does Martha Redbone have in common with William Blake? Well, the rumors are all the same [laughs]. That he's insane! He was a spiritualist but not crazy about the idea of organized religion. He questioned the idea of that, and so do I. I think he was very very brave. He took chances. He was a maverick. He didn't really care what other people thought. He really spoke his mind. I actually care what people think but I speak my mind anyway [laughs]. People kind of wrote him off as a madman but when you look at his writings, he was absolutely brilliant. That's something that I could never admit to being. I'm far from that. Let's rewind ten years ago, just before the release of Skintalk. Could you have envisioned going in the roots-oriented direction that you've taken on The Garden of Love? Absolutely. The first idea of making a record to honor my home came at that time. I bought an autoharp and a dulcimer because I wanted to do something right after we had completed Skintalk. My grandmother passed away. We lost a lot of elders in our community. I wanted to sing the songs that I sang in school and that I know my mom sang in school and my grandparents sang and so on and so forth. That was the idea back then. We finally got around to doing it. People have to understand we're an independent label. It takes money to make a record sound good. In spite of all the technology and what people say, there's still a huge difference from Garage Band and going into a studio with your band. We're also a live organic soul band, as well. It's no different from this roots project. Almost all the players are the same players, which is also a testament to their musical vocabulary. These are all guys from the midwest, except for a couple of them, so they're very well-rounded. They grew up on the same stuff that I grew up on in Kentucky. They're from Chicago, so we all pretty much had the same Top 40 stations and heard a little bit of everything, from Glen Campbell to Funkadelic, all on one station. That's how it was back in the day in the midwest. When you said you lost elders in your community, what specific community would that be? That was in Black Mountain in Harlan County, Kentucky. This used to be a thriving, coal-mining town and then that mine closed and along with it went the income. There aren't many jobs available. There's a lot of poverty. I read that you moved from Harlan County to Brooklyn when you were eleven. Was that much of an adjustment? No, because I was born in New York City. My mom is from there. There's one particular incident that I will write about on the follow-up to the William Blake album. I was going to start the sixth grade in Kentucky and then my parents decided to bring me back to New York. It was almost October, so school had already begun. I was this newcomer. It was a Catholic school. I said, "I don't have a uniform. These kids are wearing these plaid uniforms." She said, "Well I don't have money to get that until I get paid." She got paid once every two weeks and they'd just paid for me to come up from Kentucky, so money was limited. She ironed me a nice powder blue blouse and a navy blue skirt. I had these blue moccasins. I remember my first day of class. I walked into the schoolyard and everyone knew each other. I kind of stood there. I didn't know where to go or what to do but I remember people staring. Then finally one of the nuns came over and said, "Oh you're starting today?" They rang the bell and everyone had to freeze and then go into their lines in the schoolyard before we went into the building. I remember standing on the line and all of the girls looked at my shoes and cracked up. I remember thinking, What's wrong? I thought my moccasins were beautiful but the girls cracked up and nobody talked to me. That was the one time I really felt alone. I don't know if it was a culture shock so much but just a very lonely feeling at 11-years-old. How did you come out of that lonely feeling? At what point did you decide that the work of William Blake would be the vehicle for the roots project? It was what you would call a happy accident or a brilliant mistake. We'd met John McEuen in L.A. at a gig. Aaron and I were a duo. He was just accompanying me on the keys. There were about seven bands. Everybody had 10 or 20 minutes to do their thing. John happened to be at this gig. He really liked what he heard, which was interesting considering that there were all these crazy rock bands thrashing about. We were the antithesis of what was going on that night at Hard Rock Café, which is also known to be this loud, bombastic kind of place. We were the opposite of that. Because of that, I think we stood out. Then we discovered that John was also based in New York. We said we would get together. Finally the light bulb came on to do this project. John was so sweet and he invited me to sit in with him on a couple of shows. We ended up doing a couple of songs together. I picked out a few mountain songs that I liked. Aaron and I thought, Maybe we should ask John to produce this record that I'd been wanting to do, at that time, for six years. We approached him with this idea. He said, "Yeah let's go for it. That's a great idea." We ended up with about seven or eight songs in our little repertoire of classic mountain tunes. We were looking for one or two more songs. We have tons of books at home. Aaron found the anthology of William Blake. It opened to "A Poison Tree", where the spine is bent. He saw that and he immediately knew that it would make a great song. He brought that to me and I immediately heard a melody. "I was angry with my friend, I told my wrath, my wrath did end." To me, I can imagine a preacher saying that in a sermon. We started flipping through the work and we saw another piece on the next page or a couple of pages later, "I Heard An Angel Singing". Then we found another one. These songs just screamed Appalachia to me. The imagery, the language, the sound. We thought this is too good to take just one poem. Since we're honoring Black Mountain, let's honor William Blake and do a whole album of Blake poems. We looked through about 150 poems and we narrowed it down to about 50 that are really lovely and really spoke to me. We narrowed it down again to 25, and then made melodies and put music to them. John looked at us and thought it was brilliant. He really loved it. He got it. He worked his magical arrangements on them. He heard exactly what we'd done. He really helped bring that together. Your voice is so powerful on the title track. It sounds like you're on a mountaintop. That's exactly what I wanted. I'm a lyricist and when I write songs I kind of have a vision of the setting. Maybe it's because I have a vivid imagination, but I imagine what the video is going to be like in the context of any song that I've written. The first thing that I had imagined was the sound of the mountains with the wind rustling through the trees and me coming out on our front porch at home and just shout-singing. The whole idea of the call and response -- "weeping, weeping" -- that's the way it works in the hollows. You call out for whatever it is, to whomever it is -- like my grandpa coming back from hunting -- and other people holler back. You're testifying and then you have people answering, everyone is around you hearing it and understanding. I really like that idea. Our engineer Nick Sevilla got that mountain sound. I think these lines in "The Garden of Love" are so chilling: "So I turn'd to the Garden of Love, That so many sweet flowers bore. And I saw it was filled with graves, And tomb-stones where flowers should be ..." It's very dark. Blake has so many different meanings that one can see things in just about anything. "The Garden of Love" actually begins when it says, "I went to the garden of love and saw what I never had seen". That's the beginning. The two opening verses are actually some miscellaneous writings of William Blake's that we found in the book. "Then I went to the heath & the wild, To the thistles & thorns of the waste, And they told me how they were beguiled, Driven out & compelled to be chaste." I felt that really painted the scene for "The Garden of Love". It's like this forbidden thing that you are not allowed to enjoy. What I love about "The Garden of Love" is "Priests in black gowns walking their rounds, And binding with briars, my joys and desires." To me, I saw that as sexual frustration. That's how I read it. I love the idea of the sexual frustration part and setting that up with Blake's miscellaneous writings: "I laid me down upon a bank where love lay sleeping." It paints the scene for what I wanted to convey in the poem. Tell me about the character in "How Sweet I Roamed". For me, there are two meanings behind "How Sweet I Roamed". We learned that was one of the very first poems Blake had ever written. I thought he was in his twenties when he wrote this poem. It turns out he was 13 or 14 years old. We discovered that from Blake specialists. I saw the poem as two separate things. One was during the time that this was written, if this was when he was 13 or 14, women were considered property in America. The idea of someone being dazzled with lilies: "I fell for him and he put me in this gilded cage and mocked my loss of liberty". You can imagine hearing that as a woman. The other idea that really spoke to me was the idea of what happened to Native Americans. We were dazzled with things and our land was taken away from us. We were offered these little pieces of land all over the place called reservations. Then the government mocked our loss of liberty. We chose the bizarreness of making "How Sweet I Roamed" into this waltz because we thought it would be sinister, that you had no idea you're kind of dancing to your demise. Wow, that description just gave me goosebumps! What sort of emotional process did you go through while recording the album? I was just talking about this to the students at the University of Iowa. They did a class on William Blake, which was really fantastic. They are studying Blake so this was right up their alley. It was so amazing to be invited as their guest speaker. With these poems that we chose, the melodies came as pure inspiration. I can't even tell you where they came from. I didn't even think about it. We ran to the studio, Aaron shoved the mic in front of me and hit record, and said, "Okay now you can do what you want and we'll make sense out of it later." That's how we did it. It was pure inspiration. I wanted to do a straight-up mountain holler. We discovered that poem after the bulk of songs we did. I went back and looked again. I wanted to do a real a cappella mountain holler with no music. l liked the idea of the word "echo", which is great for a holler. Sure enough, staring in front of me was another sign. William Blake knew that I was going to do this song. He knew that John McEuen was going to produce it for us. That second verse says, "Old John with white hair". If you ever get a chance to meet John and spend time with him, one thing you learn from the very first time you speak with him is that he's got six kids and a bunch of grandkids. He loves his children. He talks about them all the time. He gets so much joy out of listening to them and hanging out with them. He adores them and they adore him. He's really proud of them. There's no ego there. It's from a pure place. Sure enough "The Echoing Green" has "Old John with white hair, Does laugh away care, Sitting under the oak, Among the old folk, They laugh at our play ..." It's exactly him. When I found that, I e-mailed him and said, "John, William Blake knew that you were going to do this record." He cracked up. It's really special. I had to do it. It was a real gift. What does "I Rose Up at the Dawn of the Day" evoke for you? I loved Blake's kind of devil-may-care attitude about the church as an institution. Growing up in Kentucky, most things happen in the church. That's the community gathering place for everything. To have him question the idea of hellfire and brimstone and you have to do the right thing ... I loved his take on it. He's basically saying, Yeah I know I should be doing the right thing. If I'm gonna pray, I'm going to pray for other people not just for myself ... if I bother praying at all. I love that. He's brilliant. The irony of it is we made this poem into a gospel song! They always say that so many writers and musicians are not appreciated during their own time. People discover you long after you're gone. If you're one of the ones that manages to be discovered, it's pretty amazing. I was really proud to breathe life into something that we used to have to study in school. You take an exam and then you forget about it. The poems are so special and I think the meanings are so relevant to things that are happening today. We're all judging each other for our religion and our religious beliefs. We're all still fighting wars and fighting for equal rights and all of these things that are in these poems. I'm really curious about "Why Should I care for the men of Thames". It's different in that it's spoken word and yet you have this chant. The juxtaposition of that is very interesting to me because you have Jonathan Spottiswoode who's English and then you have you and the singers doing this Native American chant. Tell me about the process of merging those worlds. The reason we chose that poem was because Blake talks about his disgust for slave-trading, which was going on at that time. He couldn't stand it. That's why he says he was born on the "cheating banks of Thames". He couldn't stand the idea of what the government was doing. He says, "Tho his waters bathed my infant limbs, The Ohio shall wash his stains from me. I was born a slave but I got to be free." It's amazing because the Ohio River is on Shawnee land. My grandmother is Cherokee and Shawnee. Blake didn't say the Mississippi. He didn't say the Gulf. He said the Ohio shall wash the stain from me. That's where my family first began and where my ancestors came from, who were English as well. They came and took/married a lady who was Shawnee and Cherokee and the rest is history. That's why I chose that poem. I was actually going to recite it myself but my accent is somewhere between Kentucky and New York! I just don't have a gift for spoken word. I admire my friends who do. They're amazing how they speak with such power, with the positioning and the pausing. I just can't do that. Put a song in front of me and I can sing anything. I sang a traditional Shawnee chant and then we decided to have Spottiswoode recite the poem. He's a friend. I've sung on all his records, pretty much, and I felt that he could be the voice of my great-great-great-great grandfather. He's the one who came over who I imagine left for a better life. A lot of people who came to America during those times were being persecuted themselves and hoping for a better life. Not everyone was rich or looking to become rich. They needed a place to start over. I'm so glad we're having this conversation because I really understand how much this album means to you, especially with all of the parallels between Blake's poems and your life. I know both your parents have passed away. How do you think they'd respond to the album? My mom knew that I was working on it. She got to hear that before she passed away so I know she'd be thrilled to bits. My dad was the singer in the family so I know he'd love it. His siblings are still alive. They've come to the shows and they love it. This album has taken you all over the country. Are the songs received differently depending on where you perform? We've played festivals to outdoor concerts on the lawn to cabaret rooms. I really think that the response has been pretty amazing because it's a fun show. It encourages people to go back and read and rediscover. I like having a good time but if you can take something home that encourages you to look further, then I'm really happy. In a nutshell, we take you all the way to church and back home again. That's kind of the journey that we do in concert. I feel like people are going to church and getting fed some good soul food! When people come to see you, whether it's free or whether they have to pay, you want them to forget anything that was bothering them. You want to send them home feeling great and with some hope. That's kind of my mission with everything. In reading different responses to The Garden of Love, I love what Vernon Reid wrote about how the album "sings a poem of prophecy, whispered by the oldest tree in the farthest corner of the valley." You've really moved people to be poetic in how they express the experience of the music. Vernon's brilliant and he's got such a gift of being able to express himself. He's so smart! He was the first person who I called and said I would love for him to hear the album. I sent him four songs. He e-mailed me what his thoughts were. That's really special. At the time, our son was three. I didn't know if anybody was going to get it because it was such a pigeonholed-type of thing. I didn't do it for that. I did it for the family, just to point out this really special place where my culture comes from: African American, Native American, English. This is my neck of the woods. I thought this was just a nice way of doing that. I didn't think anyone was going to get it, certainly not on the scale of what it's done so far. John Schaefer from Soundcheck and Robert Siegel of All Things Considered ... I never in a million years imagined that it was going to be on those programs! I'm so thrilled about that. It's just been blessing after blessing. My first question to you was what do you share in common with William Blake. My last question is what do you share in common with Martha Redbone of ten years ago? I'm still the same person. I really am. I still share many of the same things. In fact, I'm maybe even more intense with an extra mouth to feed. When you lose a parent, that changes you. When you lose both parents, that really changes you. It makes you an adult. That very first week after you bury them and you want to pick up the phone, that is a reality check. You cannot do that anymore. Then you become the elder, especially when you become a mother. Trying to raise a child and be a performer and be a mom at the same time is tough without a real family support system, with no grandparents or aunts or uncles. That part of it has made me more grounded in a sense and more determined to do right as opposed to what should make me more money, because you're setting an example for someone. You have to live by what you say because you are their TV. They're watching you the whole time. You have to try to do everything you can with integrity.